If you want to automatically capture and release the keyboard and mouse input when working with your Mac OS X and Virtual Machine applications at the same time, you should install Parallels Tools in your Virtual Machine. The Parallels Tools installation enables the SmartMouse feature. 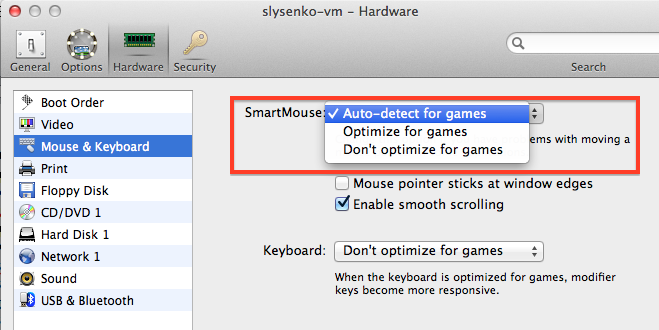 If you select Don't optimize for games (On in previous versions), the mouse input will be automatically captured in the virtual machine window when the mouse pointer hovers over it and then released when it moves back to Mac OS, which will make the mouse move seamlessly between your Mac and the virtual machine. If you select Optimize for games (Off in previous versions), you will need to click inside the virtual machine window to capture the mouse input, and press Ctrl+Alt to release it back to your Mac. It may be convenient if you want the mouse pointer to always stay inside the virtual machine window in the Window and Modality view modes (ex. : when playing some games). Note: Ctrl+Alt is the default key combination. You can define another key combination for releasing the mouse by following KB #114781. If you select Auto-detect for games (Auto in previous versions), the option will automatically become disabled (Off) each time you use a game, graphic application, or any other program that uses its own mouse pointer instead of using the operating system pointer. The option will be automatically enabled (On) after you quit the application. Smooth scrolling makes working with applications more convenient and obvious, however, some applications cannot handle smooth scrolling properly. These applications cannot draw sufficiently small scroll deltas and it makes an impression if inertia. Please disable smooth scrolling if you face this behavior. When using scrolling in the virtual machine, Guest OS does not operate with the device directly. Parallels Desktop catches the scrolling events on the Mac side, and sends them in the virtual machine. 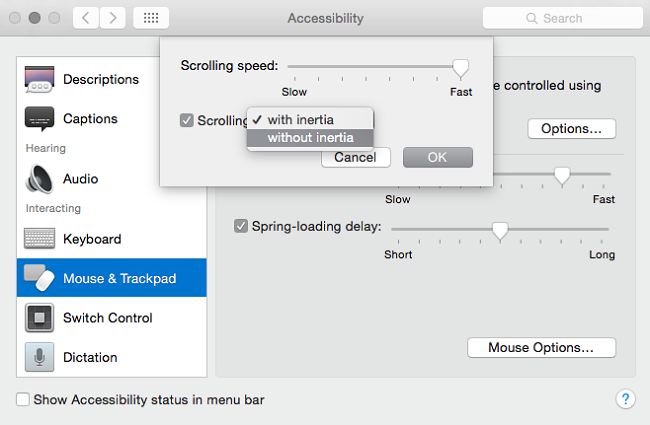 Since virtual machine cannot identify what is the cause of this or that scrolling event (the use of scrolling with inertia or scrolling without inertia), there is no way to disable inertia scrolling in the virtual machine if it is enabled on the Mac side. Click the Apple icon in the upper left corner of your screen followed by System Preferences from the context menu. Click Accessibility option to open its preference pane. Select the Mouse & Trackpad and click Mouse Options… (Trackpad Options…). Select an option other than Inertia scrolling from the drop down menu beside Scrolling. In current version of Parallels Desktop, you can use the mouse wheel horizontal scrolling when working with Virtual Machine applications windows. This feature is available only if Parallels Tools are installed in the Virtual Machine.